SUNNYVALE, Calif., Jan. 22, 2014 — (PRNewswire) — Fujitsu Semiconductor America (FSA) today introduced the newest generation of its high-performance graphics SOCs for automotive, building security and industrial applications, a powerful and versatile device that combines the latest ARM® CortexTM-A9 dual CPU core with state-of-the-art, embedded 2.5D and 3D graphics cores. The new MB86R24 is FSA's third generation of proven graphics SoCs. It provides optimal CPU and GPU performance for rapid processing and sharp image rendering, with six full HD input channels and three display output channels, allowing for highly flexible input/output control. The device's 3D core incorporates Imagination Technologies' POWERVRTM SGX543-MP1, which supports open standard API formats such as OpenGL® ES 2.0. The POWERVR core uses Tile-Based Deferred Rendering (TBDR) for render processing, which reduces performance loads on the CPU and GPU, and increases system capacity. The MB86R24 architecture has been optimized for simultaneous use of all functional blocks, virtually eliminating performance gaps. Its harmonized structure permits simultaneous rendering of independent 2.5D and 3D graphics. The chip can capture multiple video streams, display content to multiple sources, and can take input from six cameras at the same time, providing excellent flexibility in rendering 3D images for a wide range of scenarios. The MB86R24 is an ideal design choice for dashboards, heads-up displays, central information displays and rear seat entertainment systems in automobiles. Fujitsu's powerful 2.5 D engine provides unique features such as on-the-fly warping insures HUD images maintain proper proportions regardless of surface variations. A motion blur algorithm is designed specifically to smooth the motion of fast moving bitmap images such as tachometer needles. 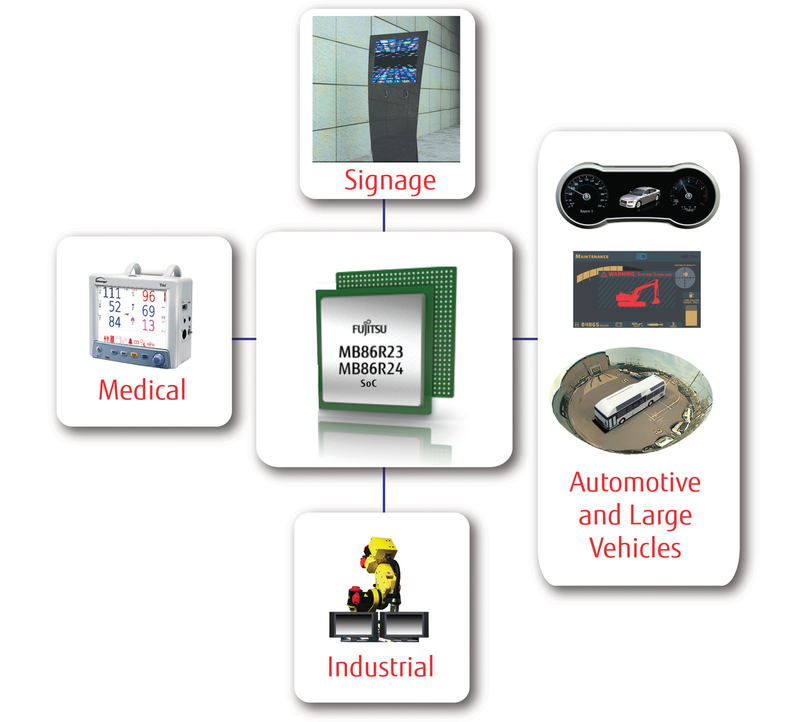 The eight layer architecture provides additional flexibility and performance to the HMI development process. It is possible, for instance, to have graphics running at different frequencies on different layers. One common use of this feature is to have the 2D needles running at twice the frequency of a 3D mapping program with both images blended automatically by the MB86R24 advanced display controller. Another example is the 'hardware accelerated signature unit' which prevents images from being displayed in an incorrect position on the screen. The MB86R24 will be available in sample quantities starting in April, along with associated software. Using the MB86R24, Fujitsu has developed an unique 360° Wraparound View System, which allows drivers to check their entire surroundings in 3D from any angle. 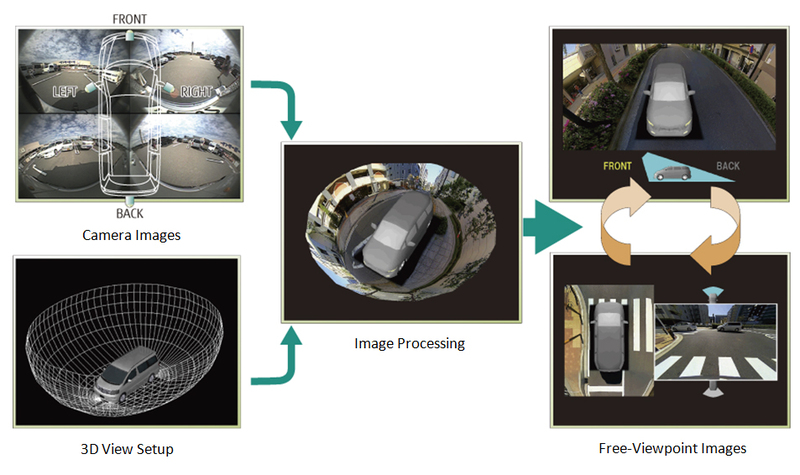 The 360° Wraparound View System uses cameras facing forward, backward, left, and right to synthesize a 3D model of the environment and then display the surroundings from any perspective. The MB86R24 features hardware support for the surround view system enabling seamless blending between camera images. 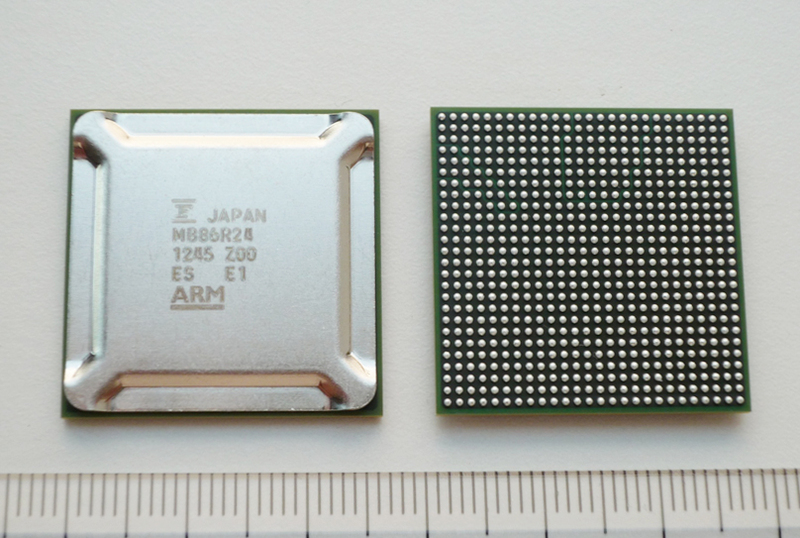 Last year, Fujitsu Semiconductor developed a 360° wraparound view system that employed a second-generation MB86R10 series graphics SoC and also worked with megapixel cameras. Systems such as this give clear visual confirmation of a vehicle's surroundings. They are growing in popularity, with expectations for additional functionality that reduces the likelihood of driver oversights while promoting safer driving. 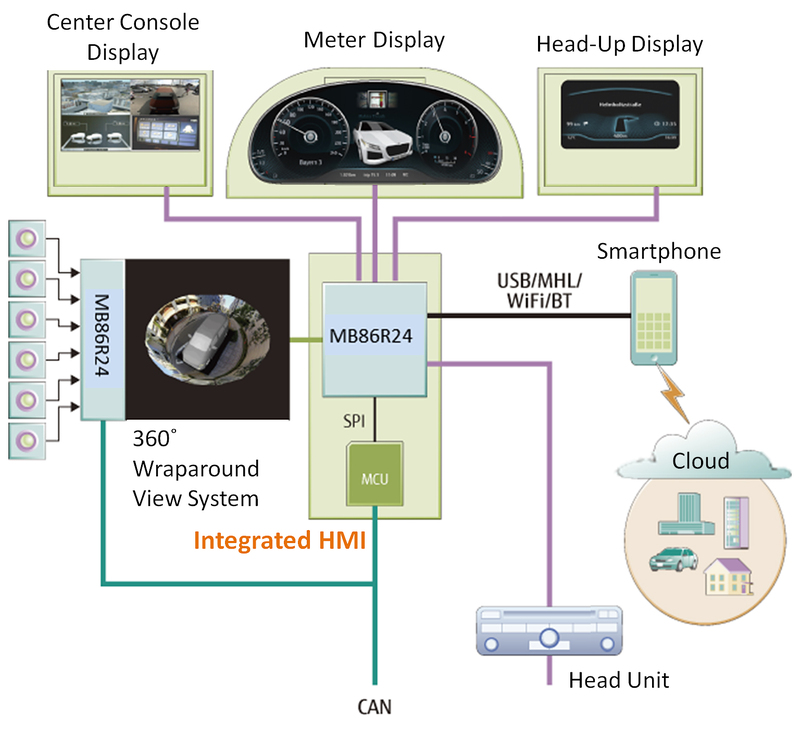 The MB86R24 SoC facilitates the development of modules and platforms for displays that can be incorporated into multiple models, rather than one-off development for each car model. This enables a significant reduction in part counts for display systems, while also making it easy to reuse products in different car models. Fujitsu Semiconductor also offers the software needed to build these systems. This enables one-stop development of high-performance systems. Fujitsu Semiconductor America, Inc. is a leading designer and developer of innovative semiconductor products and solutions for new generations of consumer, communications, automotive and industrial products. The company provides a comprehensive portfolio of high-quality, reliable semiconductor products and services throughout North and South America. Founded in 1979 and headquartered in Sunnyvale, California, Fujitsu Semiconductor America is a wholly owned subsidiary of Fujitsu Semiconductor Limited (FSL), Japan. For product information, visit the company's website at http://us.fujitsu.com/semi, e-mail Email Contact or call 1-800-866-8608. For company news and updates, connect with FSA on Twitter ( http://twitter.com/FujitsuSemiUS), Facebook ( https://www.facebook.com/FujitsuSemiconductorAmerica), or YouTube ( http://www.youtube.com/FujitsuSemiUS). All product names mentioned herein are trademarks or registered trademarks of their respective owners. Information provided in this press release is accurate at time of publication and subject to change without advance notice.